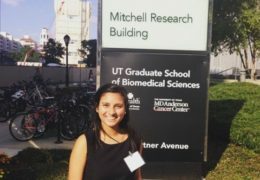 Rising senior Meaghan Nazareth is a biostatistics major and chemistry minor within the UNC Gillings School of Global Public Health. She conducts research with the UNC STARx Program, which seeks to understand self-management and transition from pediatric to adult-focused health care. When I was younger, my aspirations changed often. I wanted to be a singer, a spy, an architect, a doctor, a professional swimmer — and everything in-between! Share the pivotal “moment” in your life that helped you choose research as a career path. When I became a research assistant and started working with patients, I realized I’d found a way to positively impact people while simultaneously contributing to the scientific community. Last year, for example, one of our major projects was the development of a comprehensive content booklet to teach youth with chronic kidney disease (CKD) about what they need to know to successfully manage it. The booklet includes information about CKD, nutrition, insurance, finding new providers, and other important topics. Whether they learn a little bit more about their medications or gain an improved understanding of insurance, it’s always rewarding to know that we are helping to educate patients to be able to better take care of themselves in the future. In October 2015, Nazareth gave an oral platform presentation about her work at the Healthcare Transition Research Consortium meeting in Houston, Texas. I got to help develop content for a mobile application to teach adolescents with Type 1 diabetes about the science behind their disease, as well as other factors like nutrition that they need to know to successfully manage the condition. Take advantage of the opportunities that come your way. Through working with the STARx Program, I’ve had the opportunity to publish my own first-author manuscript, present my research to more than 100 health care professionals, help develop a mobile application, and work with a large interdisciplinary team and collaborators from around the world. This experience has not only made me a better researcher, but also has allowed me to learn new skills that I may not have learned before.